For the last five years, the people of Merauke Regency, in Indonesia’s southern Papua province, have been resisting a large-scale agriculture project that threatens the livelihoods of more than 50,000 people. Their resistance has effectively slowed the development of the 2.5 million hectares of concessions linked to the “Merauke Integrated Food and Energy Estate” (MIFEE) project. However, the government has recently announced new and ambitious plans that threaten the food and forests of Merauke’s Malind indigenous majority.The land allocated to the project – more than 55 per cent of Merauke’s total area – was chosen because the government considers it as “unproductive” and sparsely populated. The vast monoculture agriculture project is in line with a 2008 Presidential Decree on large-scale investment in food and agriculture. Responding to the global food crisis of the time, the government saw the development of large-scale plantations as a way to feed Indonesia’s growing population as well as contributing to feeding the world. MIFEE has been controversial from the start because it will destroy part of the Papuan forest, which is the world’s third largest tropical forest, and threatens the homes, food supply and forests of the indigenous Malind community. While the stated goal of the project is to produce rice, corn and other food crops intended to ensure national self-sufficiency and reduce food imports, the majority of the location permits covering 1.5 million hectares (a first step to obtaining a concession) issued for Merauke as of 2014 were for crops which are usually exported. Seventeen sugar plantations cover 580,000 hectares; eight oil palm plantations occupy 266,000 hectares; seven industrial tree plantations (mostly of acacia and eucalyptus) cover a total area of 594,000 hectares; and food crops including large rice and cassava farms make up the remaining 70,000 hectares (1). This map comes from the initial planning documents from 2010. No maps have been published since then to show the current plans. Strong resistance in Papua and throughout Indonesia has slowed MIFEE’s expansion. But the newly elected President Joko Widodo, better known as Jokowi, announced during a visit to Papua in May 2015 his plans to establish the area as the nation’s rice bowl over the next three years. He said that 1.2 million hectares of rice farms would be developed, producing 60 million tonnes of rice annually. 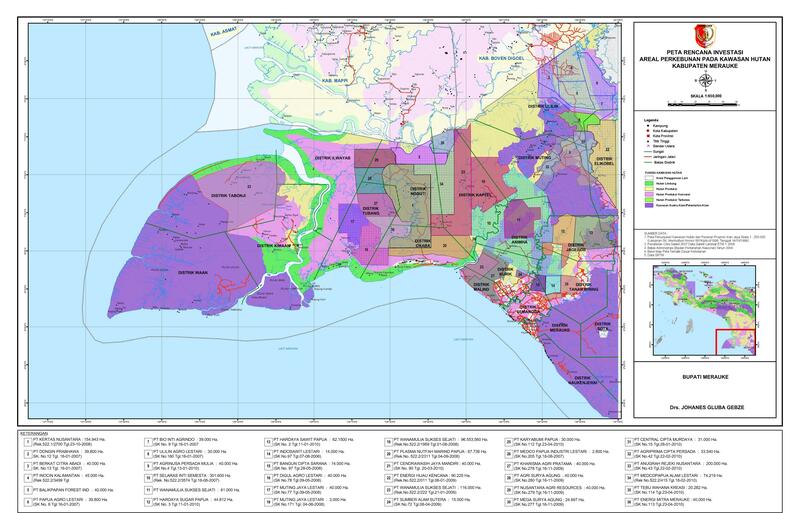 He even said the area allocated to MIFEE would be expanded to 4.6 million hectares (2).That announced figure is clearly impossible, as it would be equal to the total area of Merauke Regency. Even looking at the smaller but still staggering figure of 1.2 million hectares for new rice farms, it is not clear where land would be found in the Regency alongside already existing plantations, community housing areas and the Wasur National Park. The announcement appears to have been spontaneous. Soon afterwards, a follow-up meeting to work out details was held between representatives of the Merauke Regency administration and agriculture minister Andi Amran Sulaiman. A local newspaper reported that Sulaiman gave the local government authorities only three days to prepare a framework for developing 1.2 million hectares of rice plantations; 250,000 hectares to be developed this year, and another 250,000 hectares every six months thereafter (3). The central government said it would provide seven trillion rupiah (US$ 534 million) per semester to support the plans. The state-owned fertiliser maker, Pupuk Indonesia, has been given the task of raising the initial amount, which will be used to clear and develop 750,000 hectares of rice fields (4). Another 250,000 hectares will be managed by the Agriculture Ministry and a further 200,000 hectares will be offered to private companies. President Jokowi was invited to visit Merauke by Medco, which is currently the only company actively experimenting with growing rice agriculture in the area. The company – more usually involved in oil and gas production – is one of the pioneers of MIFEE, but its record so far hasn’t been good. One of its subsidiaries involved in timber extraction, PT Selaras Inti Semesta, became well known as one of the worst companies in the area after it tricked the community of Zanegi into handing over its forest for minimal compensation. Poverty and conflict followed, and the company itself failed to make a profit and was shut down a few years later, but only after destroying a vast swathe of the forest and leaving the villagers with no forest and no income (5). Other private companies are yet to publicly commit to participating in the programme, although one newspaper report mentions Wilmar International and Sinar Mas as being among the conglomerates that have expressed an interest in investing in the project (6). Both companies are among the largest in the oil palm plantation sector, with the production of palm oil as their core business. Rice is a staple food for Indonesia’s population and all across Asia and it is mostly produced by small scale farmers. According to Indonesia’s 2013 agriculture survey, there are 14 million rice farming households in the country, more than half of the total of 25 million rural households. The majority are small scale farmers who own less than half a hectare of land (7). Today, small scale peasant agriculture produces nearly all of the 44 million tonnes of rice grown in the country. Developing rice cultivation on the scale announced by Indonesia’s president can only be done using large-scale monocultures, with fully mechanised methods and heavy input of agrotoxins. If rice production is centralised in the hands of a few state-owned and private corporations, what will happen to the livelihoods of the country’s millions of rice farmers? The MIFEE project area covers 160 villages in Merauke. For the Papuan people it could mean the loss of their home and territory. It could also endanger their source of food – the staple here is sago rather than rice – and animals from the forest. Jokowi’s plan continues to follow a top down national food and agriculture policy, leaving no room for discussions with communities in Merauke or with Indonesia’s rice farmers in general about what they believe is needed to achieve food sovereignty. Despite the fact that during his election campaign, he talked a lot about food sovereignty. The rhetoric argument of increasing national rice production remains a simple transfer of lands from indigenous peoples to big companies. With more than 1.5 million hectares of land already occupied by plantations in Merauke Regency, it is not clear where the land being talked about now will be found. The 1.2 million hectares probably refers to land originally earmarked for MIFEE in 2010. If so, it is highly unrealistic to imagine it could be developed within three years. To begin with, permits for oil palm and sugar cane plantations have already been issued for virtually the whole area. Also, in many places, Malind indigenous communities, who have rights over that land clearly stated that they will not surrender any more of their land to corporations. The initial development of MIFEE has created havoc for the communities and the environment in the area. Expanding the project on such a large scale will only create more pressure for the communities and further destruction of forests. Relaunching MIFEE shows that decades of bad policies in the interest of tycoons and multinational companies to control land and natural resources remains. Enough is enough, it is time to denounce MIFEE and return the land to the Malind people. (1) Y.L. Franky, “Yayasan Pusaka”, Presented at limited discussion on Jokowi’s agriculture program, Jakarta, 20 May 2015. Figures are rounded to the nearest thousand hectares. (8) Testimony of Zanegi villager during limited discussion on Jokowi’s agriculture program, Jakarta, 20 May 2015.